There is little more indulgent than holing up in a luxury hotel with a sublime spa for all your pampering needs. Tropical Sky uncover the world’s most blissful retreats - the top 10 spa hotels, designed to relax, revitalise and rejuvenate. The scene: Hidden deep within the luscious forest, Qamea Resort’s Jungle Spa is a peaceful sanctuary, offering wonderful Fijian body therapies and French facial therapies alongside the soothing soundtrack of ocean waves lapping against the nearby shore, and native birds singing amongst the trees. The naturally stunning location and tranquil treatments helps to truly relax and renew the mind, body and spirit. 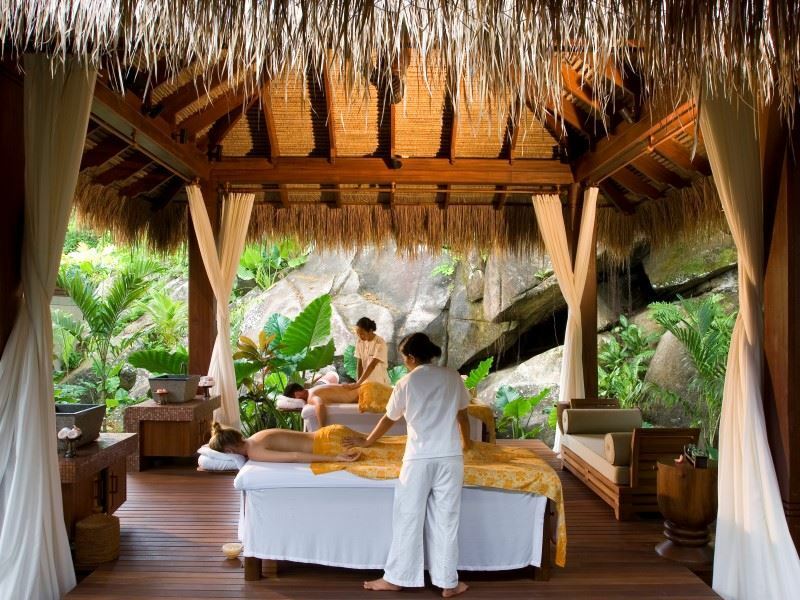 Signature treatments: The Jungle Spa uses gorgeous Guinot products to pamper you from head to toe. We love the After-Sun Burn Reviver, which uses a cream created with coconut oil and aloe vera (and high in vitamins A, C and E) to soothe and revive sunburn and itchy bites. The cooling face treatment with cold stones wouldn’t go amiss after a day of exploring, either. The scene: As one of the most spacious in the Indian Ocean, this spellbinding 75,000 square-foot spa at Shanti Maurice is built around an enchanting tea pavilion, surrounded by flower gardens and lily ponds. Taking the holistic approach to a whole new level, guests are soothed into a Zen-like state of tranquillity with a huge assortment of Western and Eastern therapies and beauty regimes. 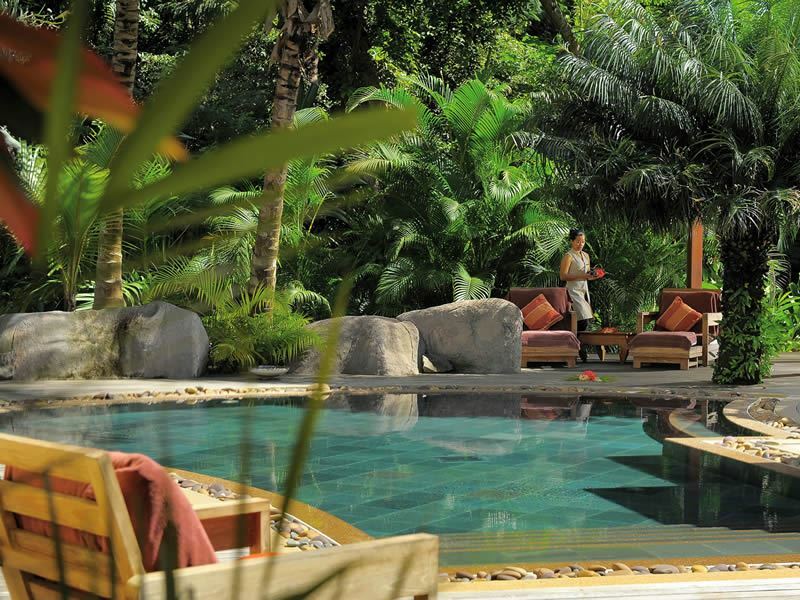 There are 25 treatment rooms and a serene swimming pool within the spa grounds. 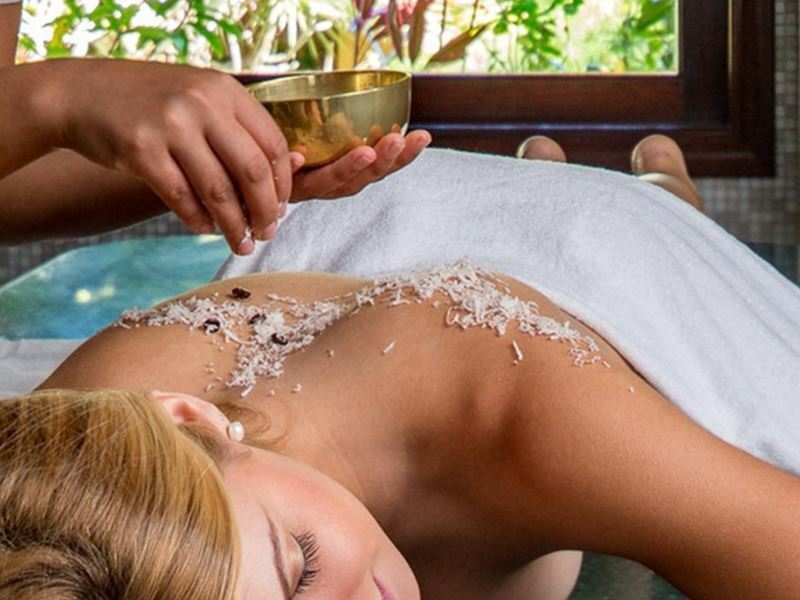 Signature treatments: Using the ancient science of Ayurveda to treat the body, mind and soul, treatments are designed to promote serenity and inner peace. The newest signature treatment is ‘Sega Ritual’, which is performed on the beach and aims to rejuvenate the skin through exfoliation with organic sugar syrup and massage. 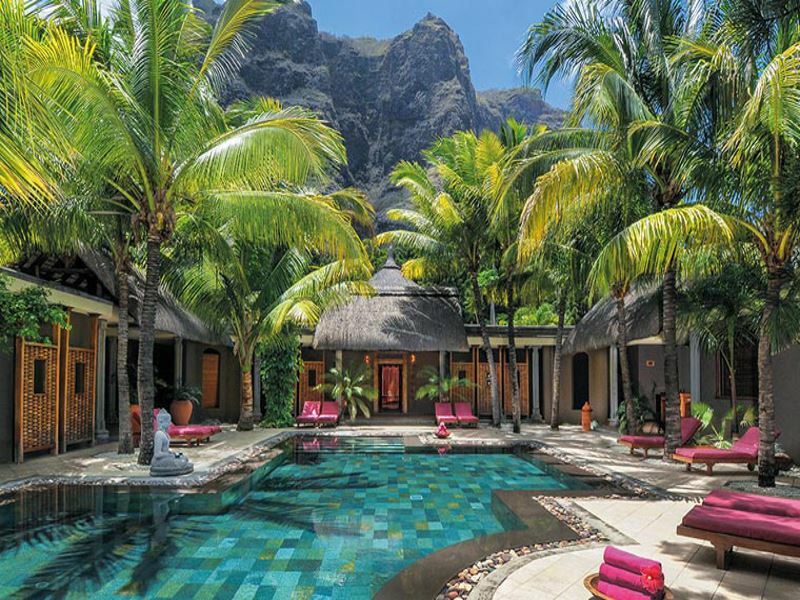 The scene: Beauty aficionados can indulge in a wealth of feel-good treatments at this temple-like oasis, housed in a stone building at the foot of the Le Morne Brabant Mountain's Dinarobin hotel. There is a four-cabin area dedicated to Ayurvedic treatments complete with ‘dharapaathis’, tailor-made tables hewn from single pieces of wood imported from India. Highlights include balneotherapy rooms, hydro-massage rooms, steam baths, hammams and a sleek slate-lined pool with Jacuzzi jets. Signature treatments: As the first spa in the Indian Ocean to be affiliated with the prestigious Clarins brand, the pampering menu is extensive. Signature toxin-boosters include Japanese Tatami, Shiatsu and the signature Dinarobin massage. 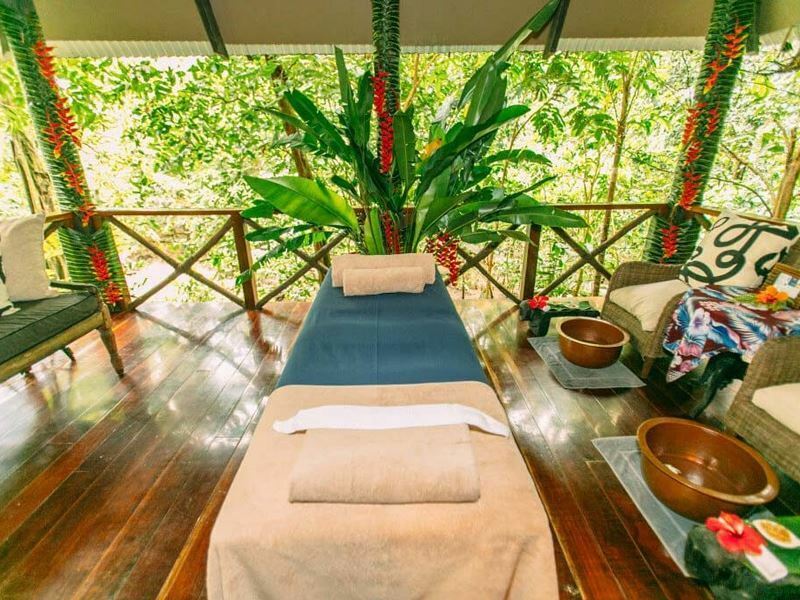 The scene: With pretty birdsong and the sound of water trickling down granite rocks, you’ll feel your whole body relax before your treatment has even begun at Maia Luxury Resort's spa. Comprising of three open-air pavilions, each separated by natural rock formations and featuring their own garden, this is your chance to immerse yourself in nature and rebalance your mind, body and soul. The luxurious Omorovicza products were created especially for the hotel, combining Asian intuition with European refinement. Signature treatments: There are a number of tranquil and invigorating massages we feel you should try, including the MAIA Signature Massage that involves a unique fusion of consistent pressure, gentle stretching and long strokes. The Twenty Dancing Fingers massage is wonderful too, with two therapists using firm techniques to release energy. They even have special Kids Only treatments, so no one goes without a bit of a pamper. The scene: This spacious sanctuary nestled amongst beautiful manicured gardens at Sainte Anne is accessed through a traditional Japanese-style entrance. Divided into three areas – beauty, massage and a beautiful slate swimming pool with loungers — facilities include eight massage cabins, dedicated yoga room, balneotherapy room, hammams, saunas and a serenity garden. 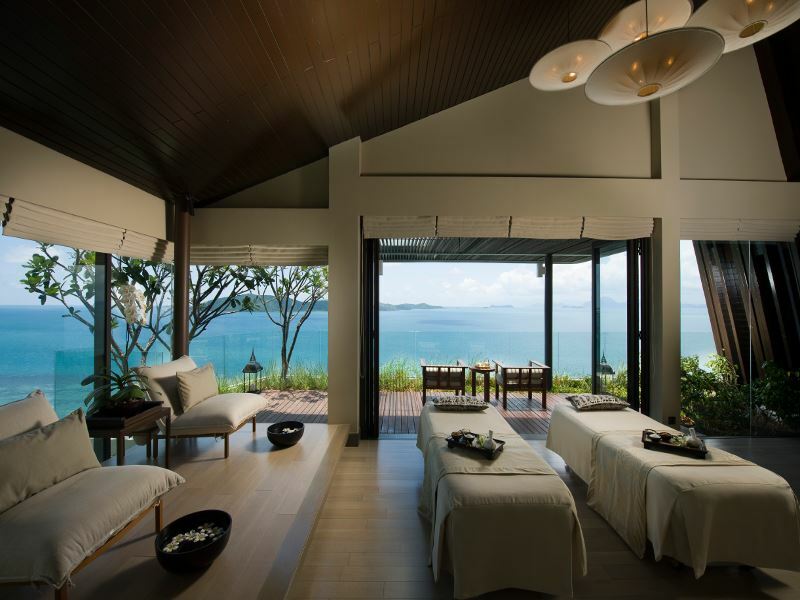 Signature treatments: This tropical oasis has teamed up with Clarins to offer a full programme of high-end skin-nourishing treatments using their botanical-based products. Other temptations include, Ayurvedic specialties, Oriental massages and the Sainte Anne Dream Time, which includes one hour of reflexology followed by Swedish and Shiatsu massage techniques using Clarins oils. The scene: Perched 3,100 feet above sea level, Strawberry Hill's Blue Mountains spa works exclusively with Aveda, famed for its high performance, botanically based products infused with pure plant and flower extracts. The spa offers five treatment rooms including a hydrotherapy room, plunge pool, sauna, dedicated yoga deck and other outdoor activities. Signature treatments: Spa lovers are taken on a ‘journey into a sense of well-being’ with a series of exotic-sounding beauty blockbusters such as ‘Lemon Grass Wrap’, a detoxifying hydrotherapy treatment, and ‘Blue Mountain Elixir’, which combines exfoliation and massage. ‘Elemental Facial’ is Aveda’s signature treatment and claims to restore balance to the skin. The scene: This newly extended 27,000 square foot underground complex in Marrakech’s most iconic hotel appeals with Arabian Nights-style dÃ©cor, marble fountains and traditional Moroccan tiles. Guests can luxuriate in candlelit chambers and savour a feast of detoxifying therapies inspired by a blend of Moroccan and Eastern cultures. On the ground floor there is a Jacuzzi and a large indoor pool. 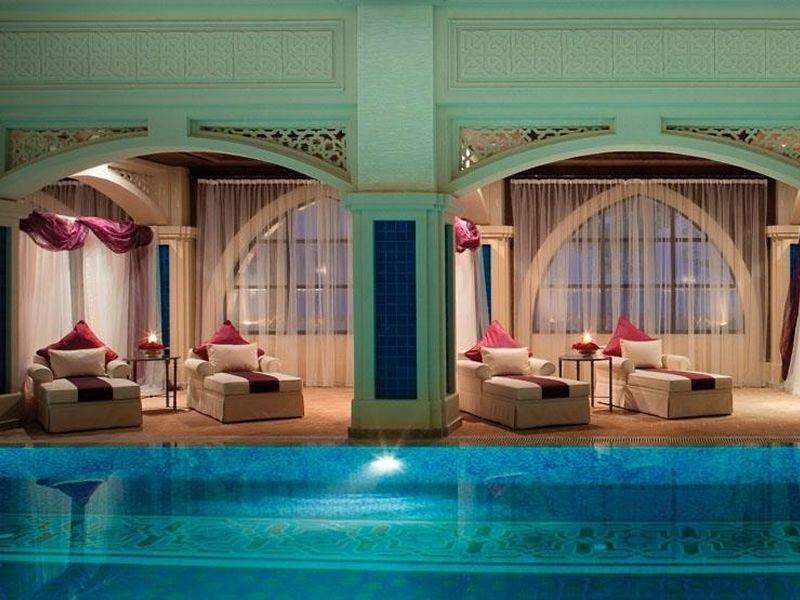 Signature treatments: This award-winning subterranean spa offers over 80 treatments using two brands; Maroc and Shiseido. The most indulgent treatment is ‘The Royal Hammam’ which includes a visit to the steam room, an intense scrub with black soap made from pressed olives and salt and a soothing mud body mask followed by a deep-moisturising massage. The scene: Set over two floors of Conrad Koh Samui, each VIP suite in this salubrious spa allures with earth-tone colours, soft mood lighting, over-sized tubs and a private panoramic deck overlooking the sherbet-white sands. Incorporating both single and couple treatment rooms, guests can luxuriate in rain showers, saunas and Thai massage rooms. For regal pampering, the Royal Treatment Suite has two treatment beds, a Jacuzzi and a private 10-metre plunge pool. Signature treatments: A plethora of treatments awaits; from Reiki and Thai massage to rehydrating facials, body wraps and scalp treatments. The signature treatment is the three-hour ‘Eden for Couples’ in the Royal Treatment Suite where each partner enjoys a gender-specific massage and facial before sharing a Candlelit Frangipani Bathology with aromatherapy oils and plant extracts. The scene: Set on the west crescent of the iconic Palm Jumeirah at the hotel Zabeel Saray, this palatial spa dazzles with ornate mosaics, crafted marble, elaborate and hand-painted murals and a fabulous Turkish hammam at its heart. Spread over two floors and including separate areas for women and men, treatments combine the ancient healing philosophies of the Ottomans with state-of-the-art techniques. Facilities include a Thalasotherapy pool, adventure showers, snow room, floating baths and 42 treatment rooms. Signature treatments: For luxurious pampering, book one of the Talise Rituals; ‘Enriched’ is a two-hour ceremony of sensuality which leaves dry skin satin smooth, whilst the four-hour ‘Signature’ is a wondrous bespoke spa marathon packed with lots of customised treatments. The scene: Having recently undergone an extensive multi-million pound renovation, this 30,000 square-foot pampering palace lures guests with ‘give us your body for a week and we’ll give you back your mind’. Recently ranked ‘Best Destination Spa in the World’ and ‘Best Spa Worldwide’ by Conde Nast Traveller, this expansive haven at BodyHoliday is housed in a Moorish-style building with a pool at its centre. Stand-out facilities include an Ayurvedic Centre, 36 treatment rooms and a temple for outdoor massage. Signature treatments: Fill your days with Zen-like indulgences and holistic activities including pilates, yoga and meditation. Most temping is the much-celebrated ‘Lucian Lime and Ginger Scrub’, an invigorating exfoliation ritual using sea salt, St. Lucian coconut oil, organic ginger and lime.